1. It considerably speeds up a house construction. 3. Workmanship of house elements is precise, which facilitates further finishing. 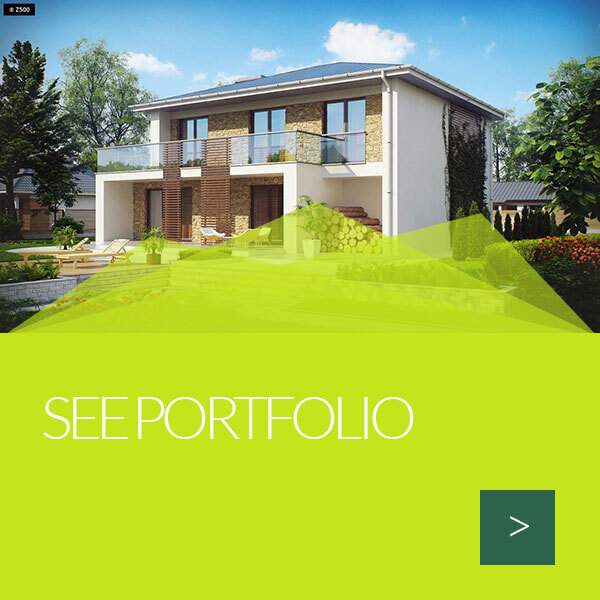 Medium-size house prefabricated units production lasts from several to a dozen days. The assembly on the construction site is just a dozen hours of work. This is the reason why more and more people find technology of prefabricated wooden houses appealing. A wall structure is pressed on a pneumatic lift table, which makes it highly compact and rigid. 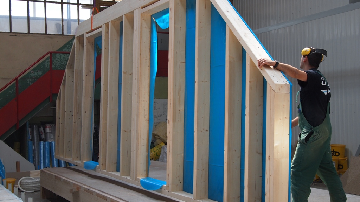 A prepared framework is stiffened with construction boards at both sides. A wall inside is filled with mineral wool thermal insulation layer. Protective pipes are prepared for electric system and places designed for plumbing systems and central heating systems. Following the principles of warm assembly and using expanding gaskets and special flanges in walls, windows and window sills are assembled. 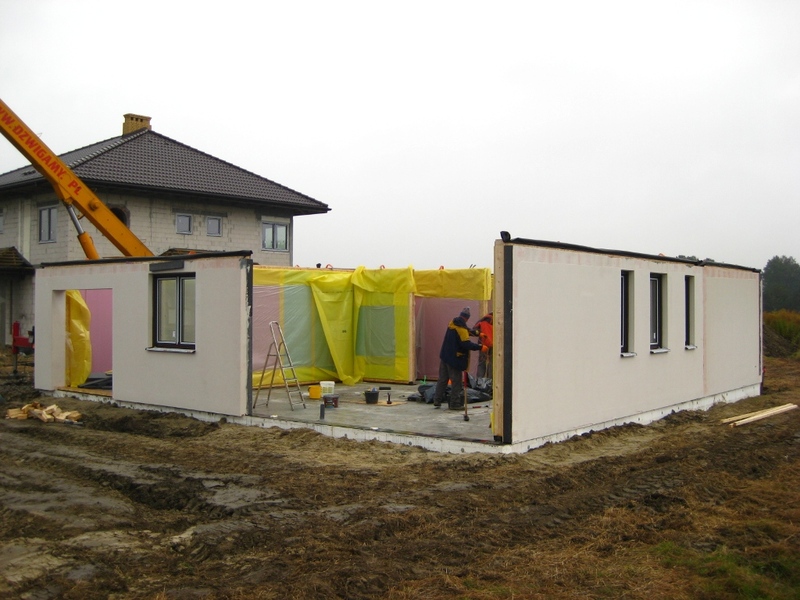 A thermal insulation layer is applied on external walls of the building (e.g. foamed polystyrene along with glue and mesh). Wooden beams are cut in accordance with shop drawings and twisted in a way that they form ceiling panels. A MFP or OSB construction board is screwed to this wooden frame. Ceilings are then filled with a mineral wool acoustic insulation. are assembled at the construction site once the installation works have been completed. Wooden beams designed for roof structure are cut in accord with shop drawings. Visible elements of roof structure are polished and painted in the production hall. Locks and mounting holes are made in roof elements. A roof structure is assembled directly at the construction site. 1. GKF board – thanks to this board, additional external wall plastering is not necessary, which eliminates the need to perform wet works and drying as in the case of a traditional plaster. 2. 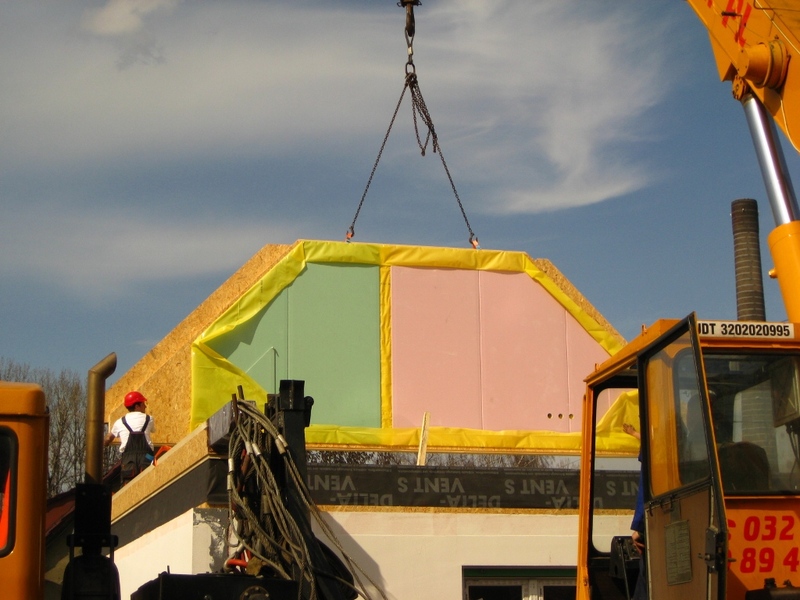 Vapor barrier film – prevents humidity from entering the inside of the wall barrier. Thanks to this, a structural timber and a mineral wool insulation material is protected against humidity (wet insulation loses its heat-insulating properties). 3. V100/MFP/OSB3 board – secures the structure against humidity, stiffens the structure, strengthens the wall, thanks to which it is easy to nail, screw bolts and pins. 4. 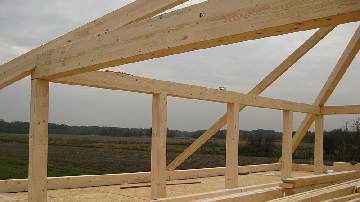 Wooden supporting structure – application of this solution allows of filling the entire space between beams and non-inflammable mineral wool insulation material. For this reason, it is possible to obtain the highest heat-insulting parameters of our barrier and thus our houses are energy-efficient. 5. Mineral wool – it is a layer of perfect thermal and acoustic insulation. Thanks to its flexibility and elasticity, it perfectly fills the space between beams, which has an impact on elimination of all types of line and point thermal bridges which affect the heat-insulating parameter of the wall barrier. 6. 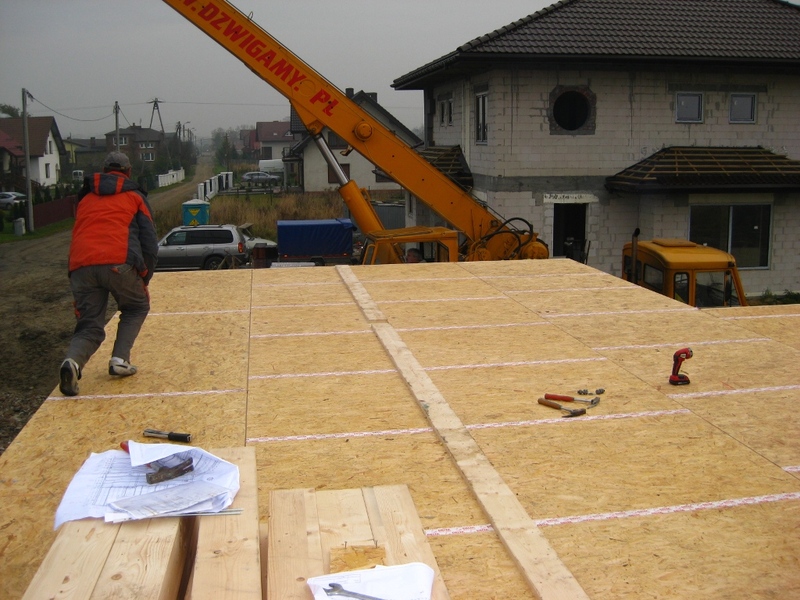 V100/MFP/OSB3 board – it is a supporting structure for the second layer of insulation made of foamed polystyrene or possibly mineral wool and stiffens the structure. 7. External (front) insulation glue – serves to stick the foamed polystyrene or wall to V100/MFP/OSB3 board. 8. External (front) insulation – it is a second layer of insulation, which improves insulation properties of the wall barrier. 9. Plaster undercoat reinforced with mesh – reinforcement layer for thin plaster. 10. Plaster – external facade layer (not included in the delivery). 1. 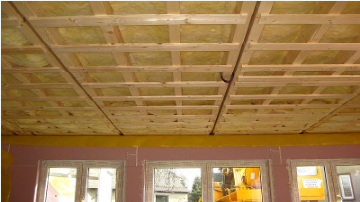 GKF board – thanks to this board, additional plastering of internal walls is no longer necessary, which eliminates the need to perform wet works and drying, as in the case of traditional plaster. 2. V100/MFP/OSB3 board – stiffens the structure and strengthens the wall, thanks to which nailing, screwing bolts and pins is easy. 3. 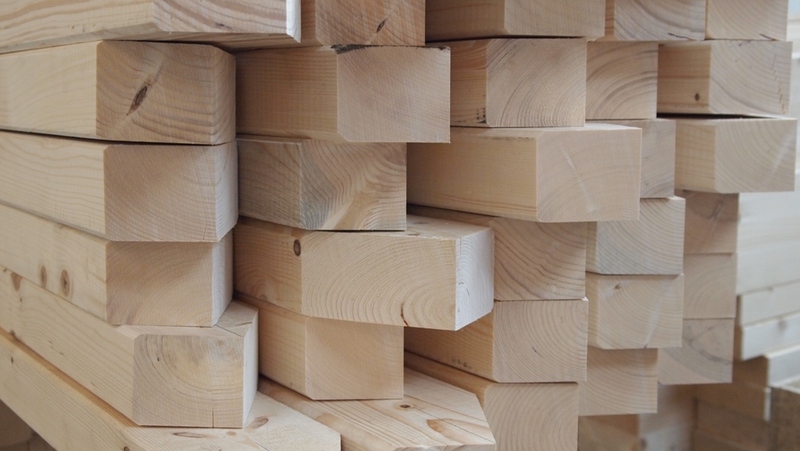 Wooden supporting surface – application of this solution allows of filling the entire space between beams and non-inflammable mineral wool insulation material. It facilitates obtaining very good acoustic insulation parameters of our partition wall. 4. Mineral wool – it is a layer of perfect acoustic insulation. Thanks to its flexibility and elasticity, it perfectly fills the space between beams. 5. V100/MFP/OSB3 board – stiffens the structure and strengthens the wall, thanks to which nailing and screwing bolts and pins is easy. 6. GKF board – thanks to this board, additional plastering of internal walls is not necessary, which eliminates the need to perform wet works and drying, as in the case of traditional plaster. 7. Wall finishing (decoration) – finishing coat, paint etc. (not included in the delivery). 1. Floor finishing – any finishes e.g. wooden flooring, terracotta, floor panels. 2. Concrete screed – loads down the floor, which improves its acoustic properties and allows of using any type of floor finishing. 3. 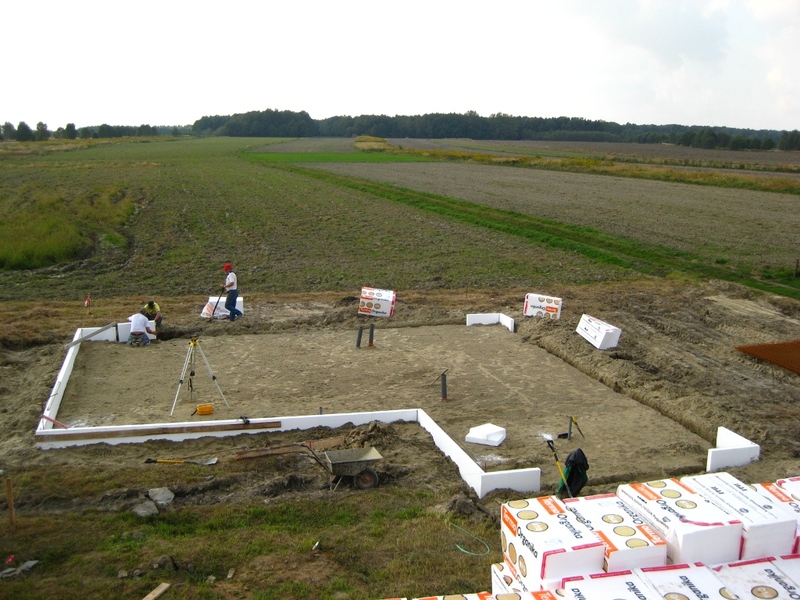 Foamed polystyrene – it is an acoustic insulation from sound impact and allows of using the systems – e.g. water, electric, central heating under - the screed. 4. Construction membrane – protects the inside of the wall barrier from damp. 5. 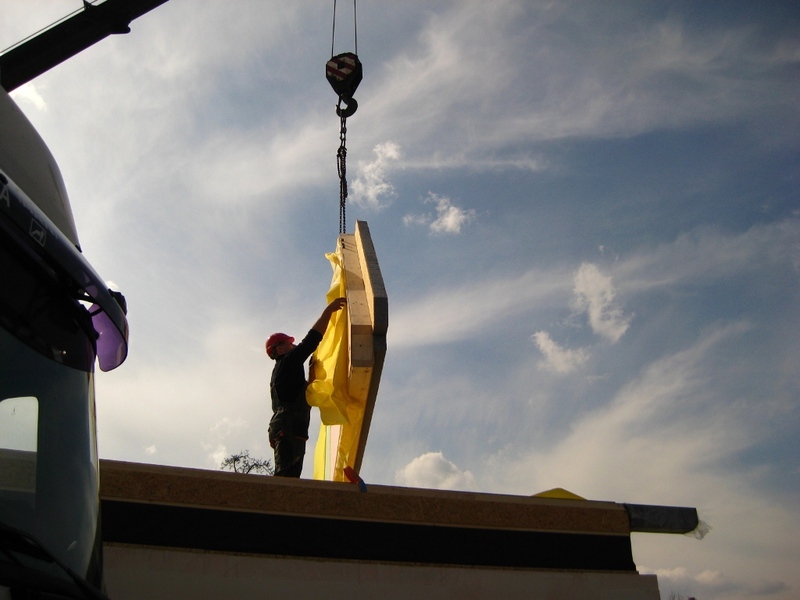 V100/MFP/OSB3 board – element transferring the balanced load into floor beams. 6. Floor beams – floor structural element which allows of filling the space between beams by acoustic insulation. 8. Vapor barrier film – protects the floor inside from damp (particularly when only the ground floor is heated). 9. Supporting framework under GFK boards. 10. 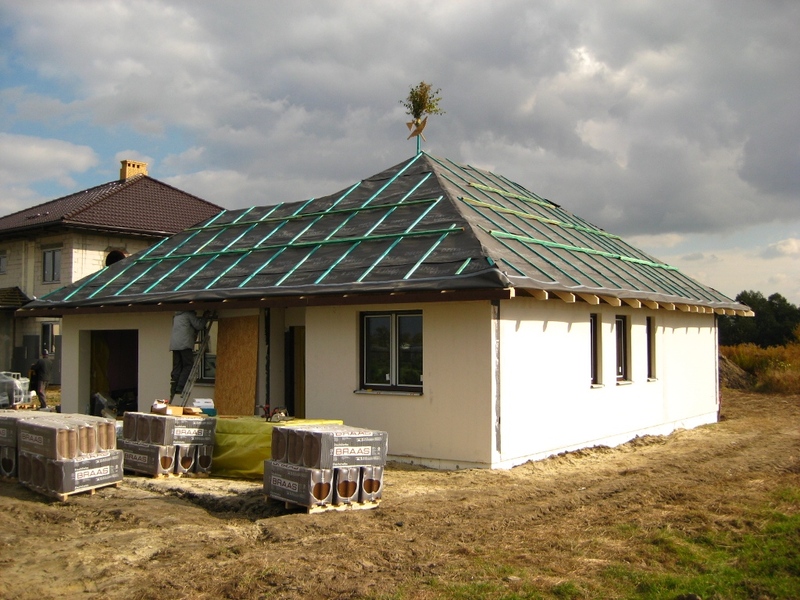 GKF boards – external finishing layer – very simple assembly, even surface, no long-term drying) as opposed to plaster. tO see a model house, call us !